Rainy days mean two things in our house: comfort food and chick flicks (sorry, James). Luckily, my mom sent me home with a pan of her legendary lasagna after a quick weekend of wedding planning back home. I had all intentions of throwing it in the freezer to pop in the oven on a hectic weeknight, but James had other plans for that pan. My mom’s lasagna is the ultimate comfort food for both of us. This lasagna isn’t super fancy, but it’s delicious and extremely easy to throw together. I like to divide the recipe into two, smaller pans — one to eat that day and one to freeze for later. 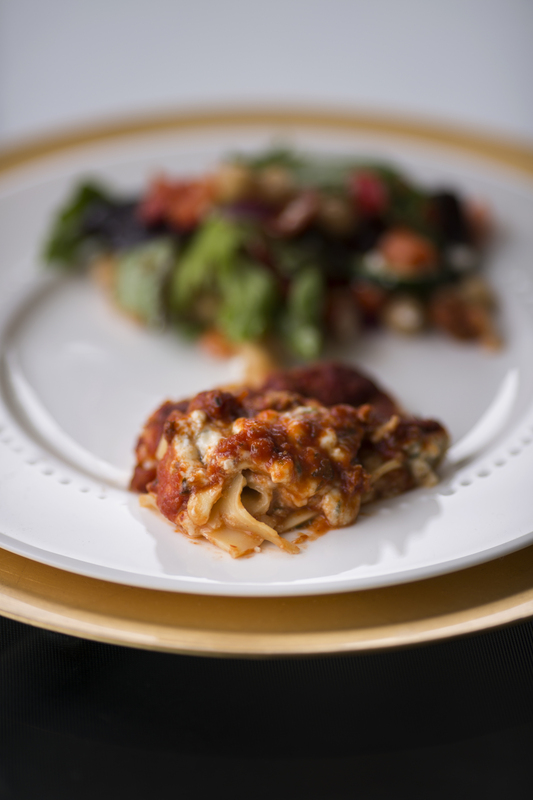 Lasagna isn’t the healthiest of dishes, but this is a lightened-up version that won’t leave you feeling weighed down. The amount of cheese is drastically lower than in a traditional lasagna, but the dish still tastes deliciously rich. I always serve this with a hearty salad so I don’t feel tempted to overindulge. Because, let’s be honest, I could probably eat half of that pan in one sitting if I abandoned all willpower. Pop this in the oven and cuddle up with a glass of wine and a romantic comedy — that’s what rainy Sunday nights are made for! Add olive oil, onion and garlic to a medium saucepan and sauté until fragrant over medium heat, for about 1 minute. Add turkey sausage to pan, cooking until browned. Drain fat and return to heat. Add 1 Tbsp. parsley, Italian seasoning, salt, bay leaf, crushed tomatoes and basil to pan, stirring until combined. Reduce to low heat and simmer for 30 minutes. While sauce is simmering, combine 2 Tbsp. parsley, egg, cottage cheese and grated cheese in a medium bowl. Set aside. 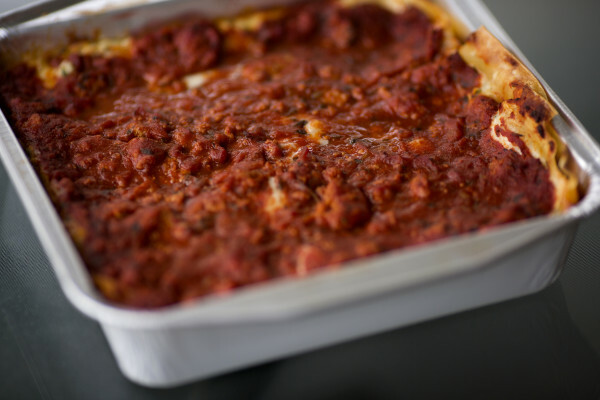 Once sauce is done simmering, start layering the lasagna. Start by placing half of the noodles in the bottom of a 13 x 9 pan (I use 8 x 8 when breaking this up into two pans) that’s coated with cooking spray. Top with half of the cottage cheese mixture, followed by half of the mozzarella and half of the meat sauce. Repeat with remaining noodles, cottage cheese, mozzarella and sauce. Bake for 30 minutes, or until edges of lasagna are bubbling. Let stand ten minutes before slicing and serving.